McALLEN — A man suspected in an armed bank robbery here Tuesday morning was arrested after evading authorities for several hours, according to police. McAllen police have yet to identify the suspect in custody and details of his apprehension remain unclear. 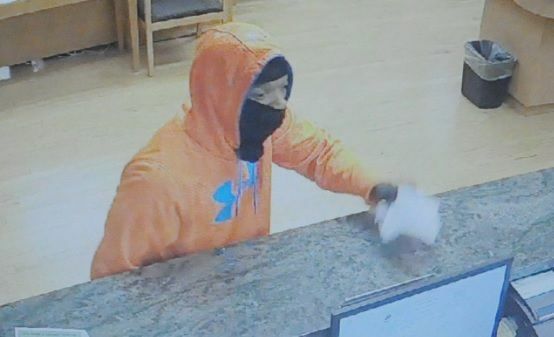 The man entered Greater State Bank, located in the 3300 block of North 10th Street, at about 10:16 a.m. wielding a handgun and demanding money, according to a news release. Authorities described him as having a dark complexion and wearing an orange hoodie with a black ski mask covering his face. “The amount of money stolen remains undisclosed,” the release stated. Following the robbery, several police officers remained in the vicinity of 3900 N. 6th St.; they were joined by a McAllen police CSI unit and helicopter. Law enforcement appeared to be searching for a vehicle outside of a North McAllen apartment building in the area. Officials were seen taking images of a dark blue Hyundai Elantra and swabbing the vehicle as evidence. A man who identified himself as Carlos Rivera said his vehicle was stolen at the nearby Stripes store on Hackberry and McColl Road. The vehicle was later found at the apartments in question. According to bystanders, the suspect left the stolen vehicle at the apartment building parking lot and ran east toward an alleyway. Authorities only confirmed that they were searching that area for the suspect. Sergio Garza, a resident at the apartment complex, said that police around the time of the bank robbery informed tenants to leave as the suspect was believed to be armed. Garza also said law enforcement officials entered apartment units and questioned tenants, showing them images of the suspect. He and other tenants were evacuated but were unable to move their vehicles from the parking lot. According to bystanders who work in an adjacent building, several properties in the area had surveillance cameras that captured the suspect fleeing the area. Police were seen racing east on Nolana Avenue from the apartment building at about noon.